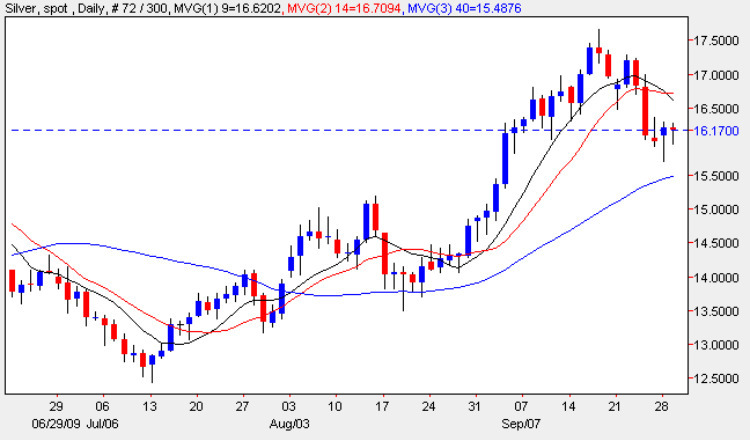 The technical picture for spot silver remains very bullish following the strong buying signal of the last few days, with the gravestone doji candle being followed by a deep hammer candle on Monday, and repeated to a lesser extent in yesterday’s silver trading session which ended with a narrow spread down bar but again with a wick to the downside. As with the hammer candle, this suggests that the selling pressure is being absorbed by the market and silver bulls, who are buying into any move lower presenting a very similar picture to that on the gold price chart, with spot silver prices sandwiched between the 9 and 14 day moving averages above, and the 40 day moving average below. For a sustained break higher, which technically we should see shortly, the move will only be validated once we have broken above both the upper moving averages, coupled with a break and hold above the previous top in the $17.50 per ounce price level. However, this is where the similarity ends between the two commodities, as above this level silver has a deep area of price congestion to overcome, before the spot silver price can breakout into new high ground above. The short term outlook for spot silver is bullish, the medium term is bullish and the long term is sideways.